In December 1968 Mick Jagger decided to make a film, or rather, he shot the film having decided earlier. Perhaps he was inspired by The Beatles’ Magical Mystery Tour of the previous year. These years from 1966 to 1968-69 were a tumultuous time for Jagger and his sidekick Keith Richards. Not least significant was that Mick had taken up with the songstress Marianne Faithfull. Then in 1967 there was perhaps the most famous drug bust in history at Keith’s Redlands house. The boys had been pushing the drug envelope hard more or less inviting a crackdown and it came in 1967 involving Mick, Keith and Marianne with devastating results for all three characters in the drama. As the authorities wished to make an example of the baddest boys of rock and roll Mick and Keith received prison sentences of which however they only served two or three days. Nevertheless their psyches had been criminalized, changed their views on their role in society. While the arrest and jail time were merited in society’s eyes, Mick and Keith who were among the legions marching to Altruria on the wings of pot convinced that their elders had irrevocably messed the world up while they were going to set it right under the influence of marijuana, LSD, amphetamines and whatever else was handy, saw the bust and conviction as unjustified interference in their dreams of perfection. The revolution was on as far as they were concerned hence they began a string of songs along the lines of Street Fighting Man and Sympathy For The Devil, unintended consequences of the bust. Oh yeah, Mick and Marianne, Keith and his main squeeze Anita Pallenberg had become involved in Satanism which was going around like the flu. Not necessarily dilettantish either like, say, I just read a great book by Satan, but the real kind as fostered by the Great Beast 666 Aleister Crowley himself as interpreted by his epigoni Kenneth Anger and Anton LaVey, not to mention the Process Church Of The Final Judgment. 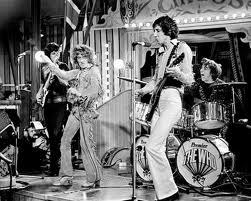 Mick and Marianne disavow any serious interest in Satanism but the Rock and Roll Circus contradicts that. Combined with these irritants in their lives Mick had just starred in a Satanic movie, Performance, and Marianne had had the misfortune of a miscarriage. To say that they weren’t suffering at the time they made their movie would be a understatement. In this hazy mental state, compounded by too many drugs, Mick cobbled together his Circus. What is the meaning of the title Circus? Ostensibly it meant literally a circus, after all it had a fire eater and trapeze artists. However it could also be a double entendre. Just as the title of their 1967 album, Their Satanic Majesties Request, parodied the Queens request on passports so the word Circus also parodied the name the British intelligence agency gave to their gig. The title can be construed as a challenge to the establishment. It would seem clear then that Mick was still seething inside because of Redlands. His film is negligible as a movie but a good concert film. The symbolism is non stop as the guest audience in dressed in some sort of Munchkin costumes. The cast was bizarre to say the least. While little more than a musical oddity Jethro Tull led by Ian Anderson in his disgusting dirty old man persona opens the show while he was followed by the Who caught in pre-Tommy persona. Never one of my favorite bands, others thought they were a good performance while we are treated to a young Pete Townshend doing a series of his trademark windmills. The couple circus acts are entertaining enough; the fire eater is pretty spectacular. John Lennon performing separately from the Beatles was probably the musical highlight of the show for me. While obviously in the throes of a serious depression personally, as a performer once on stage Lennon is charisma spilling out all over the place. The depression does show up in the name he chose for his ad hoc group- The Dirty Mac. The name characterizes the general depression and malaise of the whole show. Lennon’s group brought together some stellar lights of the time. Besides himself he had Mitch Mitchell of the Jimi Hendrix Experience on drums, Eric Clapton on lead guitar and Keith on rhythm. They are joined a by fiddler, I presume Ivry Gitlis, and the irrepressible Yoko Ono. Yoko was in her Bagism phase. While the movie is loosely shot during Lennon’s gig, if you watch the lower right corner of the film you can see a black object sort of pulsing. That’s the bag Yoko is in. I suppose as she was a performance artist the bag was Yoko’s joke- that’s the bag I’m in, get it? After a noisy rendition of Yer Blues Yoko wiggles out of the bag bouncing up with her arms outstretched as in Here I am, aren’t I wonderful? Well, she certainly shocked Ivry when she began to squeal. Yoko is very tiny so Ivry kind of looks down at Yoko with raised eyebrows, looks over at John, backs up a couple steps, stops playing momentarily and has this incredulous am I believing what I’m seeing and hearing look on his face. One might say Yoko stole the show. Really, I had to start laughing. Marianne: I have since learned that Marianne’s performance was deleted. Jody Klein substituted this picture from a French performance. It has nothing to do with the Circus. The real show stopper comes next when the camera shifts to Marianne Faithfull. She was decorously posed in a stunning black designer gown. At her most beautiful with a fine folky voice that entrancingly recalled her As Tears Go By but strong and more focused. I missed the words but caught the mood of this enchanting chanteuse. Marianne definitely trumped Yoko as a showstopper. Taj Mahal was a special case. Believe it or not Taj is still out there challenging the Interminable Tourist Dylan himself. Taj works, or did, about 170 days a year, every year. While he is not well known he began as a duo with Ry Cooder called the Rising Sons then added a string of records on his own. The guitarist is Jesse Ed Davis, a failed guitar god, who had a couple solo Lps of his own. Taj’s first two records are superb blues Lps, two of my favorites of the period. The third LP, a two record set is also quite good but begins his political period that obviated his musical career. He goes rapidly down hill after that. For some reason he chose a rather lame piece from his repertoire. If he was making an appeal for a girl or girls to join him backstage his salacious version of Hey, Little School Girl might have served him better. The Stones rounded out the show at the end. While the Who were supposed to have buried the Stones I didn’t find it so. The tension had been well maintained throughout the show with the comic interlude of Yoko and the Stones maintained it through to the end with a climax of sorts. 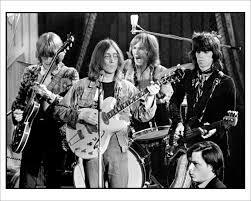 It was obvious that Mick, Keith and Marianne were in a world of hurt….and Brian Jones. That tragedy would play out over the next year when Brian drowned and Marianne almost drowned in her own tears and Mick spawned a real live Satan at Altamont. The movie ended in hurt and Satanism- homage to the Devil. Mick and Marianne had gone to see Jimi Hendrix a few months earlier. After performing Hendrix had sat at Marianne and Mick’s table where he put the make on Marianne telling her to dump the White dude and go with him. Marianne hesitated a moment too long giving Mick offense so that he commemorated the evening in his song, You Can’t Always Get What You Want. Suddenly I realized the meaning of the line, you and your friend Jimi as Mick shouted it to someone off stage to the right. OK, not my problem. So Jagger was still wearing his hair as he did in the movie Performance. That soul corrupting film was obviously still influencing him. As Marianne said, it changed his personality. The show closed with Sympathy For The Devil. There was a little stage extension on which Mick prostrated himself as though doing obeisance as the song played. It looked like he was groveling, then he looked up making a couple goofy grimaces at the camera beginning to pull off his shirt. Not necessary, Mick, not necessary. Then with the shirt off he straightened to a kneeling position to reveal Satanic tattoos a la Kenneth Anger. Anger had a large LUCIFER tattooed across his chest. Here Mick seemed to be imitating him apparently trying to tell us that the Great Satan had arrived. I hope they were transfers. Interesting, especially as the movie Rosemary’s Baby appeared in 1968 in which Rosemary gives birth to the Son of Satan. Even more interestingly in the 1990’s book sequel Son Of Rosemary Satan’s little lad was named Andy. After Andy Warhol, I presume. I suppose then that Mick conceived the film as a coming out party for himself as The Great Beast. Apparently he took his Satanism very seriously. It make one wonder, was Altamont a projection of the Great Satan?